Beetle Bluffs brings to life the stories that accompany each specimen within a natural history collection by illuminating the dynamics of nine beetle mimics and their wary lizard predator. Beetle Bluffs is a film by Anna Lindemann, developed in collaboration with Brian Farrell, Curator of Entomology at the Harvard Museum of Comparative Zoology. The film combines 2D and stop motion animation. Beetle Bluffs was completed in 2013. It was a year in the making. The music for Beetle Bluffs was inspired by the beetle mimics' biology and Cuban habitat. The music loosely references Cuban percussion and was composed by Anna Lindemann using musical gene network algorithms developed by Eric Lindemann and Anna Lindemann. The algorithms were developed as part of an ongoing exploration into the use of biological processes as a model for music composition. Anna and Eric use Random Boolean Networks (RBNs), which have been widely used in scientific research as simple models of biological systems. Their work with RBNs has focused on hierarchical systems with interconnected sub-networks running at different time-scales. Their models are simulated in Matlab and sonified using a variety of music synthesis techniques. Beetle Bluffs is inspired by a pioneering paper on beetle mimicry by Philip J. Darlington Jr. (1904 – 1983). “Experiments on Mimicry in Cuba, with Suggestions for future Study” was published in 1938 in Transactions of the Royal Entomological Society of London. The paper discusses experiments Darlington conducted during four trips to Cuba from 1926 to 1936 that document an Anolis sagrei lizard avoiding toxic red and blue Lycid beetles, and seven varieties of Lycid beetle mimics, while feeding readily on various brown beetles. At the time the paper was published, Darlington was Assistant Curator of Insects at Harvard’s Museum of Comparative Zoology (MCZ) in Cambridge, Massachusetts, home to one of the richest and historically most significant insect collections in North America. 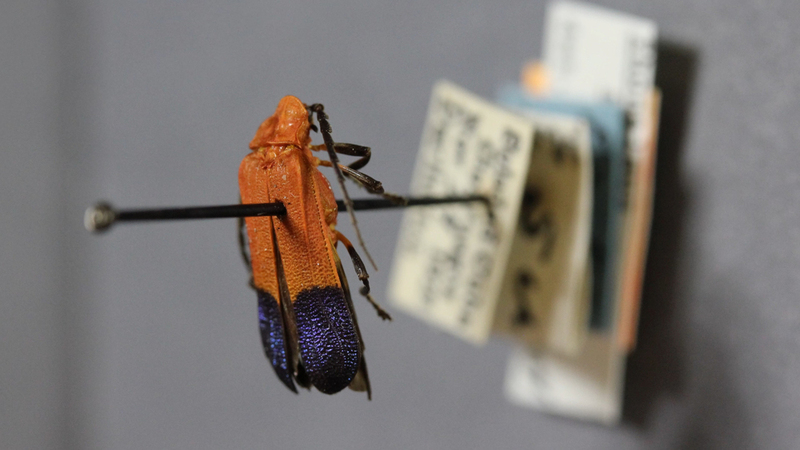 All but one of the nine original beetle specimens cited in Darlington’s paper are housed at the MCZ, but the eight specimens are distributed throughout the many drawers that hold the museum’s more than 7 million insects. Only in Beetle Bluffs are the beetle specimens brought together to illuminate the story of the beetle mimics, and a possible evolutionary origin of their mimicry. Beetle Bluffs was filmed at the MCZ and features the beetle and lizard specimens referenced in Darlington’s paper, the original 1938 illustration plate by Mr. E. N. Fischer that accompanied Darlington’s paper, and Darlington’s field journal, diary, drawings, papers, map of Cuba, lantern slides, microscope, and desk.